Our showroom started with two young women who had a concept and a vision to have all the design products under one roof. 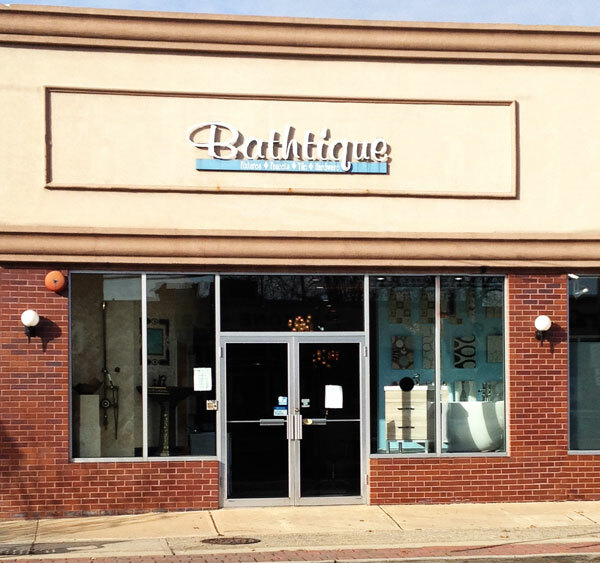 Bathtique, located on Central Ave in Lawrence, has a beautiful 4,000 S.F. showroom full of distinctive baths, vanities, tiles and all the trimmings you need to make your bathroom truly unique. Bathtique’s talented designers will transform your space into a luxurious dream bathroom; a bathroom where you can revel in the attention to detail and excellent craftsmanship. What’s in fashion and out may change frequently, but Bathtique is always up-to date. So whether your searching for a timeless vanity, an ultra-modern sink or a classic tub you’ll find it in our beautiful showroom. Matching your faucet to your sconces to the tile to the vanity and everything else can be a daunting challenge. That’s why the relaxed atmosphere of Bathtique’s showroom is the perfect place to begin your new bathroom project. You can browse countless accessories, sinks, tubs, faucets, hardware and much more to create a classy and coordinated bathroom…all at a leisurely pace. We carry a full line of plumbing fixtures, faucets, hardware and much more. To complete any project we also carry a vast assortment of porcelain, stone and glass tile. We have something for every type of design and for the most discriminating consumer. Our staff is both knowledgeable and helpful when designing your new bathroom, kitchen, or any other projects. Bring elegance to your bathroom or kitchen with Bathtique’s great selection of high quality vanities, faucets, and sinks at very affordable prices. We’ll walk you through each step of the way and you’ll walk away with a beautiful room. We hope you find our site both informative and easy to navigate. Should you have any questions – please don’t hesitate to contact us at 516-792-9856 and one of our competent customer service agents will be glad to assist you. It is our hope that you get the in-store feel even while browsing our site online. We look forward to greeting you in person!